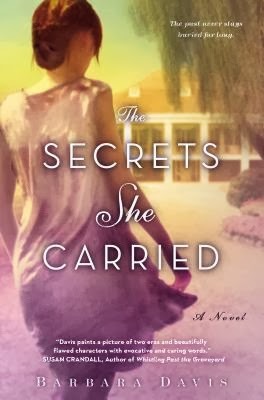 Goodreads: When a young woman returns to North Carolina after a thirty-year absence, she finds that the once grand tobacco plantation she called home holds more secrets than she ever imagined. Though Peak Plantation has been in her family for generations, Leslie Nichols can’t wait to rid herself of the farm left to her by her estranged grandmother Maggie—and with it the disturbing memories of her mother’s death, her father’s disgrace, and her unhappy childhood. But Leslie isn’t the only one with a claim to Peak. Jay Davenport, Peak’s reclusive caretaker, has his own reasons for holding onto the land bequeathed to him by Leslie’s grandmother. Before she died, Maggie hinted at a terrible secret surrounding Adele Laveau, a lady’s maid who came to Peak during the 1930s and died under mysterious circumstances. Jay is haunted by Maggie’s story, yet the truth eludes him—until Leslie uncovers a cryptically marked grave on the property. As they delve into the mystery of Adele’s death, Leslie and Jay discover shocking secrets that extend deep into the roots of Leslie’s family tree—secrets that have the power to alter her life forever. Kritters Thoughts: Two parallel stories that mingle right from the beginning as the present and the past of this one family mix to create a fantastic story. Leslie is escaping New York to return to the home that she escaped a long time ago. She finds it has changed and hasn't changed all at the same time and she must decide whether this can be home again. The characters made this book and the secrets that they were hiding to the end. With each chapter, I wanted to find out how the mystery would unravel and even how Leslie would react to the truth that was in her past. I enjoyed that there were also secrets and things to find out in the current story, mystery and intrigue throughout the book! It made me wish I had a history or family with secrets to find! I am recommending this to all readers who love a fantastic story set in a small town. This is a perfect book for those who may not read a ton of historical fiction because the history part is just as entertaining as the current storyline. Disclosure of Material Connection: I received one copy of this book free of charge from Penguin. I was not required to write a positive review in exchange for receipt of the book; rather, the opinions expressed in this review are my own. I have this one too and hope to get to it soon. It encourages me to see your high rating!